The worlds Greatest tribute show dedicated to female rock legends and powerhouse vocalists of the last 4 decades. 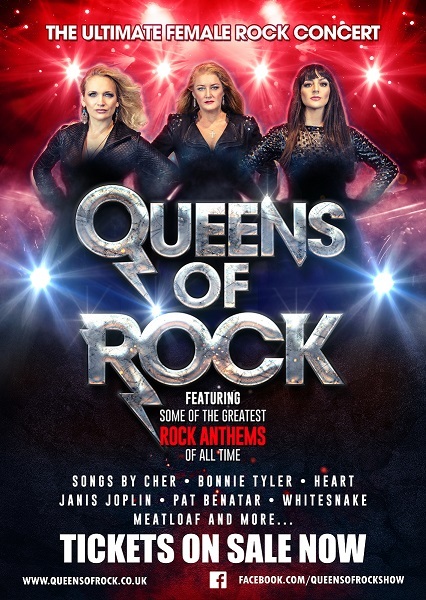 With three of the UKs most experienced and in demand Rock singers the show takes the audience on a rollercoaster ride of the most famous hits by artists such as Cher, Bonnie Tyler, Heart, Pat Benatar, Pink, Tina Turner, Blondie, Stevie Nicks and many more... With full live band, outstanding costumes and stage presence the &apos;Queens&apos; will be a sure ’hit’ with audiences of all ages. Supported by Guitar Godz- a fully live show dedicated to a generation of Guitar icons. Jimi Hendrix, Steve Vai, Jeff Healey, Prince, Eric Clapton, Brian May and Slash are just some of the guitarists of the last 3 decades you will have the chance to experience in one amazing show!